...from the Occasions Mini Catalog! I am once again offering samplers of Designer Series Papers, Ribbons and Embellishments, this time from the Occasions Mini Catalog. There are options for each described on this post and you can receive discounts for ordering two or more of the samplers. 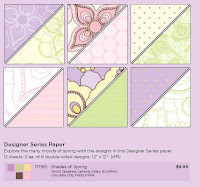 Sampler #1 -- Designer Series Paper Sampler -- you will receive a BIG 6x12" piece of each of the papers from the following -- Sending Love Specialty DSP(pg 13), Shades of Spring DSP (pg 25) and the new Sweet Pea Paper Stack (pg 33). These are BIG samples, big enough to allow you to use them in 12x12 scrapbooking pages or accent several cards or projects. You will receive 36 double-sided pages in all -- a whopping 72 unique and new Stampin' Up! Patterns, some of which are glittered and embossed. To purchase all three of these collections yourself, you would spend more than $47 plus shipping and tax. You get a large 6 x 12" sample of each of the 36 papers for only $18.95. Scroll to the bottom of this page to place an order and choose your different options. Sampler #2 -- Satin Ribbon Sampler-- You will receive a generous 3-yard sample of each of the nine (9) new colors of 5/8" Satin Ribbon(pg 27). This ribbon is incredible beautiful. It's easy to tie and adds a touch of luxury to any project. To purchase all nine spools of this wonderful new ribbon, you would spend more than $80 but you can purchase this sampler and get a 3-yard length of each ribbon for only $22.95. Scroll down to the PayPal button below to choose your options and make a purchase. Sampler #3 -- Embellishments -- There are some wonderful new embellishment in the Occasions Mini catalog and you can try them out by purchasing this sampler. 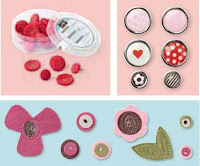 You receive one of each of 6 designs in the new Sending Love Epoxy Brads line (2 brads from each of the three color collections, page 13); You will receive 1 each of 6 different and new Corduroy Buttons and Brads, 3 Pretty in Pink and 3 Real Red (page 13); and you will receive 6 pieces from the new Sweet Pea Stitched Felt pieces (page32), one of each design. To purchase them all from the catalog, you would spend more than $41. You can try a sampling of each by ordering this set for just $8.95. Scroll down to the PayPal button to choose your options and make a purchase. Now, here's the really great news! You can purchase Samplers #1 and #2 (DSP and Ribbon) for a combined price of just $39.95. That's 3 yards of each of the Nine (9) new ribbon colors and a 6x12" piece of each of the 36 new papers. And, if you purchase all three samplers, I will give you a 10% discount, making your total combined price just $45.95 for all three samplers. It really is a great deal. If you were to purchase the full packs of each of these products, you would spend nearly $170!!! But purchasing Midnight Crafting samplers allows you to get all the new products in your hands to try out very quickly at a small cost -- and you can always purchase the full packages of your favorites once you've spent some time creating with them. I will order supplies each Friday for the Samplers that have been paid for and will ship them to you within a week of that date. You will generally receive your samplers within 10-12 days of placing your order. Call or email if you have questions before you place your order.